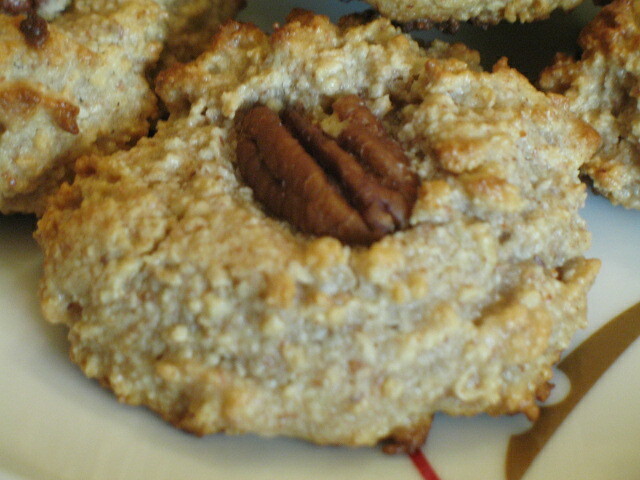 This is my first attempt at making paleo baked goods. I have been craving cookies. I wasn’t about to go and buy anything new to make these either. So, I guess you could call them lazy craving cookies. I think they came out pretty good. They are moist and not dense like I had worried they would be. They are not very sweet which is okay by me. The ones I made with raisins were obviously sweeter. After checking out a few sites for paleo cookie recipes I realize I’ll need to double the honey to get the desired sweetness. This is the recipe I made today without any changes. If you want a sweeter cookie increase the honey to 1/3 cup up to 1/2 cup. 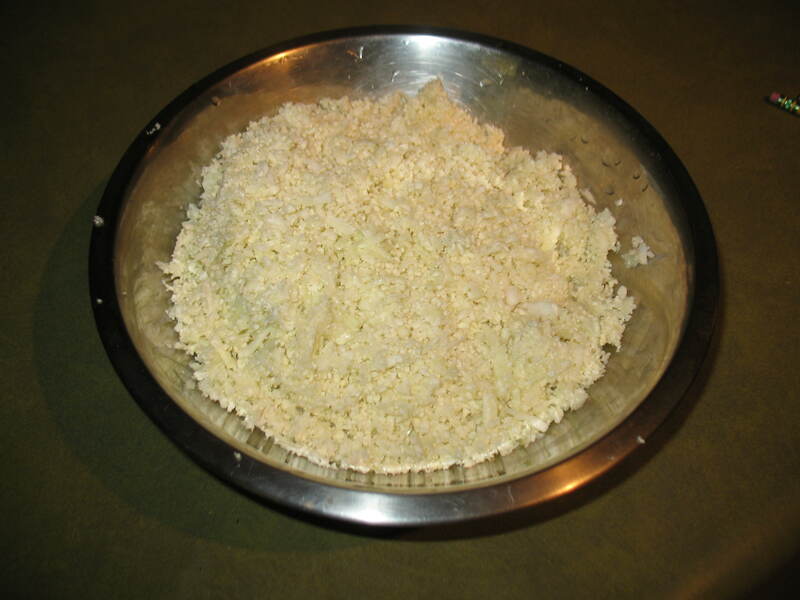 Process 2 cups of shredded coconut and all of the almonds until a fine meal is produced. You could go the easier route and buy coconut flour and almond flour, but like I said I was lazy and didn’t feel like buying anything. This way is also a little cheaper. Add your meal to a mixing bowl. 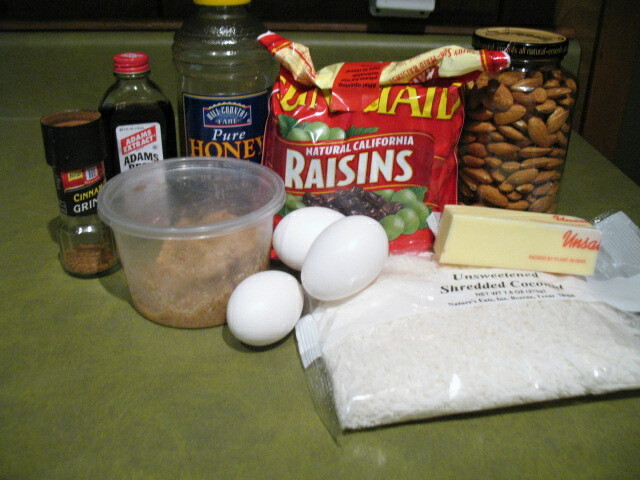 Add the remaining ingredients and mix until incorporated. 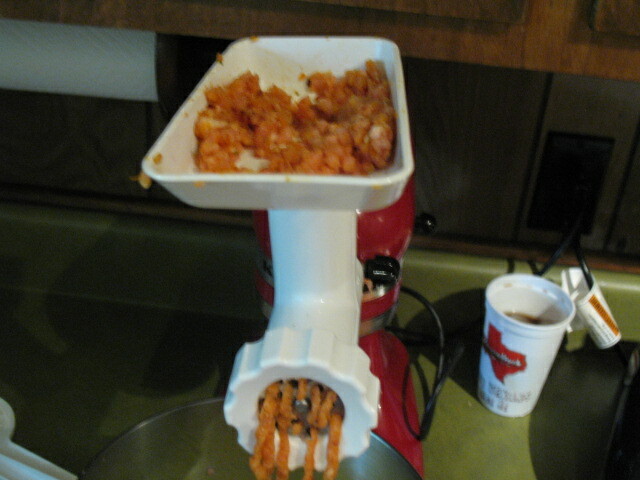 I actually removed half of the batter and placed it back in my food processor to make it finer. I’m so impatient when blending things that often it’s still too chunky. Aside from making it finer I don’t think this step did anything. If you are more patient than me I doubt you’ll need to do this. I scooped out the dough with a large tablespoon onto a greased cookie tray. I rolled one cookie out and it was pretty and prefect and round but I didn’t really like it looking that way. I preferred the haphazard look to the plopped cookies. After I plopped down as many cookies as would fit I pushed a pecan in the middle. I baked these at 350 for 12 minutes rotating halfway through. (My oven is old and heats unevenly. If your oven was made in this decade it might not be necessary to rotate. ) Half of the batter was made without raisins for T the other half had a handful thrown in and mixed in. In the time it has taken me to take pictures and type this up I’ve eaten 3. I think T (who said they weren’t sweet enough) has had an equal number. These are good. They’ve satisfied my cravings for a cookie and now I’ll have to find a way to ration myself to only one cookie a day instead of half a dozen. Leftover baked chicken thigh pan fried with scrambled egg and broccoli. 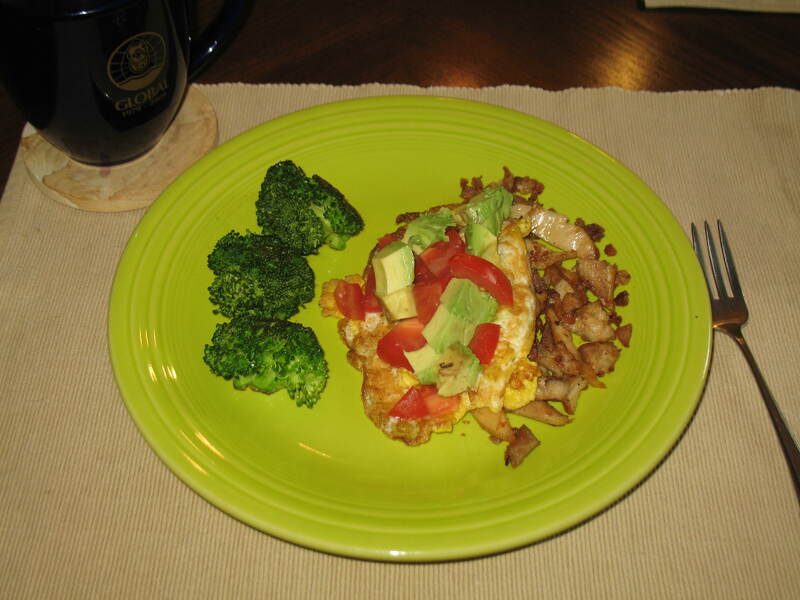 Topped with avocado and tomato. Such a great way to start the day. I’m going to blog this recipe in two parts. Mostly because there are a lot of ingredients and I don’t want to scare anyone away. Really most of these spices and ingredients are things that I have in my fridge on a regular basis and/or last a long time. Do not let the number of ingredients scare you away. This is on its way to becoming an epic meal. I have a meat grinder for my Kitchenaide mixer. I love it. 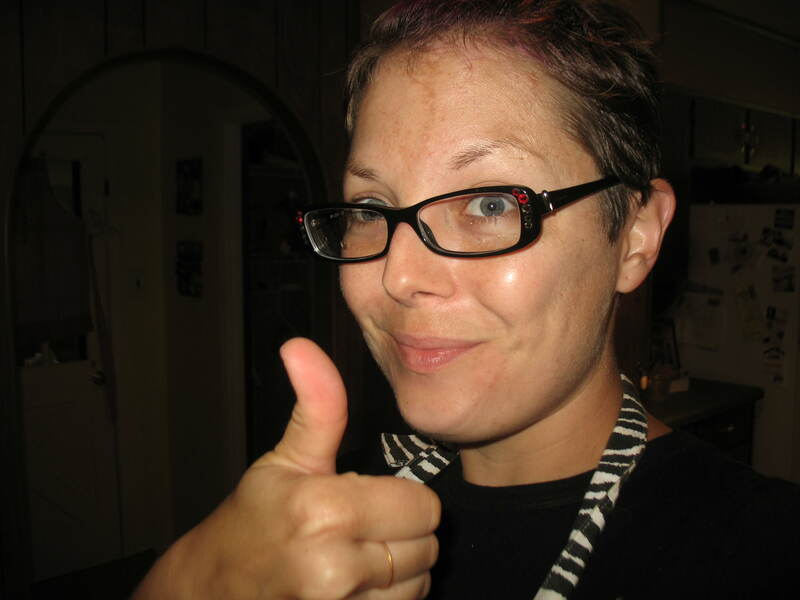 I’ve used it often and truly appreciate the results. The most important step that I’ve learned is you have to have frozen meat. The fat in defrosted meat ends up getting stuck in the grinder and it makes it nearly impossible to grind. I like to also freeze the metal parts of my grinder to help keep everything cool. The other thing I’ve learned is you want meat with some fat in it. If you grind something that has little to no fat it ends up tasting dry. You can add fat if you get a lean cut. I’ve added bacon fat with lots of success. Keep these tips in mind if you plan to grind your own meat. 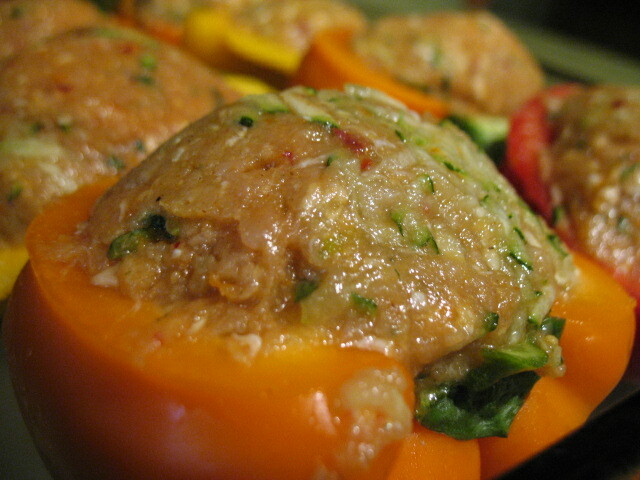 If you do not plan on grinding it find a sausage or ground meat with no added flavors or salt. 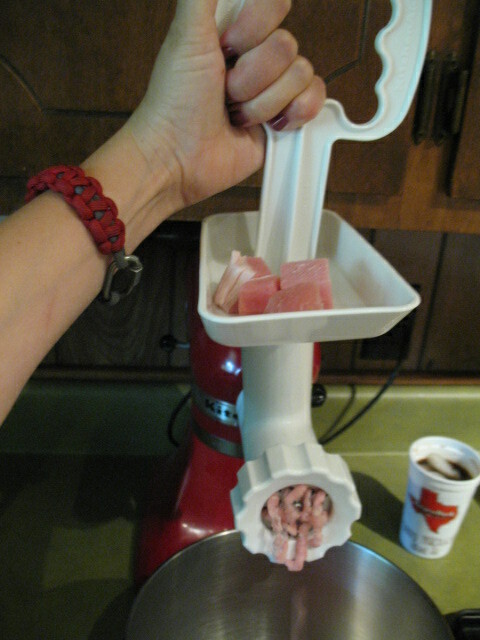 Grind pork cubes in you meat grinder on the large setting. 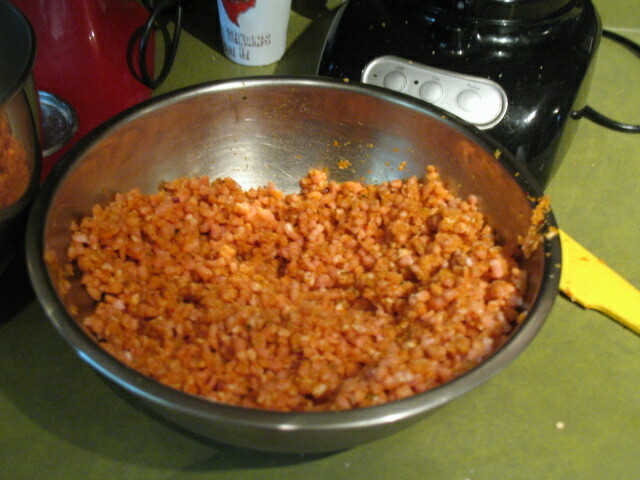 Place ground meat back in freezer while preparing the spice mixture. 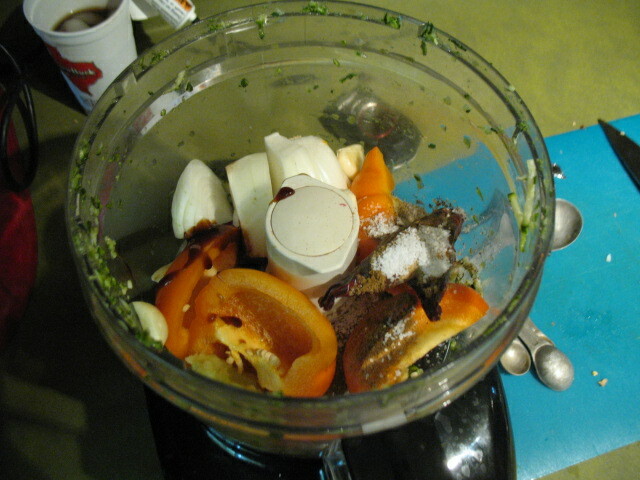 In a large food processor combine all ingredients from chilies to cloves. Blend until smooth. 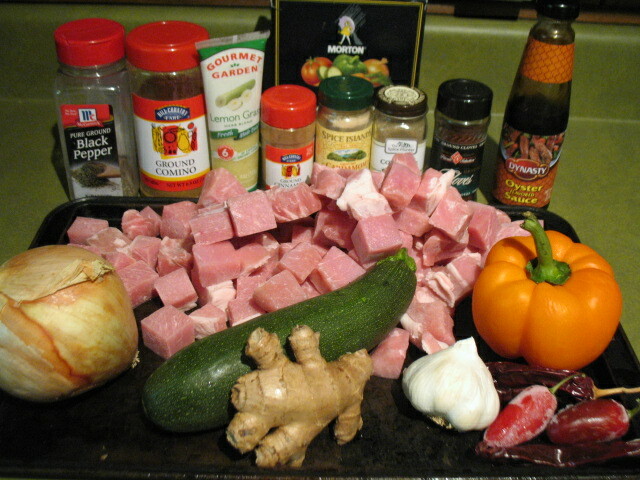 Take meat from freezer and mix up spice and meat in a large bowl. Grind the meat again the same setting. This helps to make sure the spice is evenly mixed in with the meat. 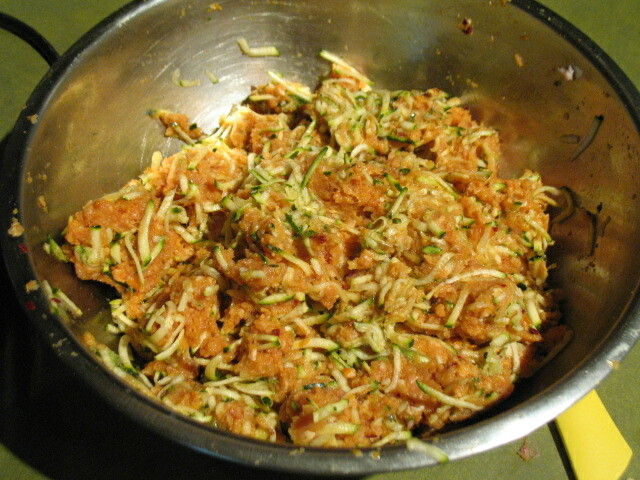 After the second grind, mix meat and zucchini by hand in the same large bowl (no one likes to dishes). Do not over work the meat. Just makes sure the zucchini is evenly distributed in the meat. Now this next step is very important when making sausage. Make a test patty! Eat said patty to make sure it is well seasoned. 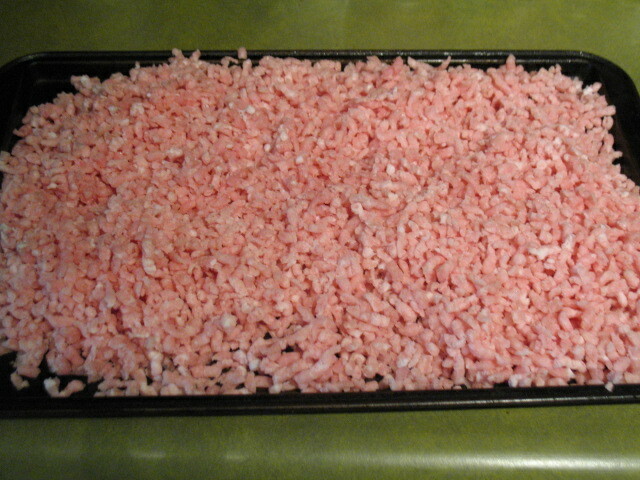 I made ground meat one time and it was so bland and boring that I ended up feeding it to the dogs. It really was that boring. 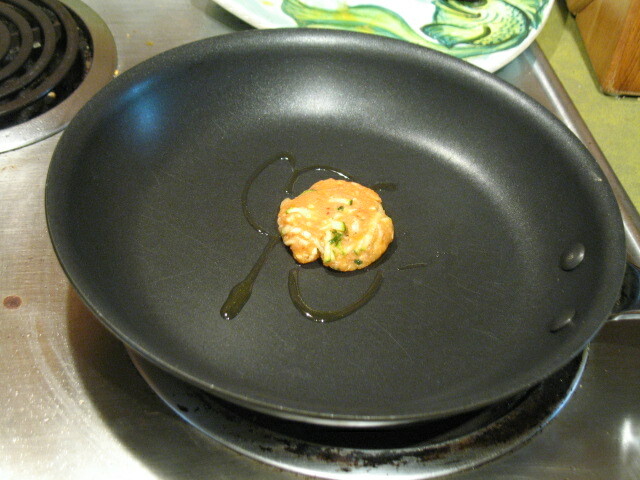 Now I always make a test patty to make sure the meat tastes good. 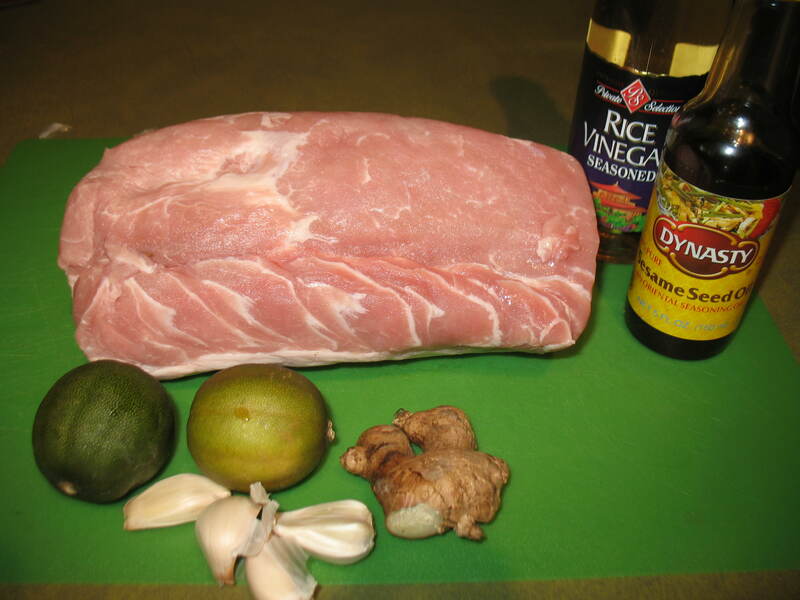 I think this recipe gave the pork a lot of good Thai flavors. 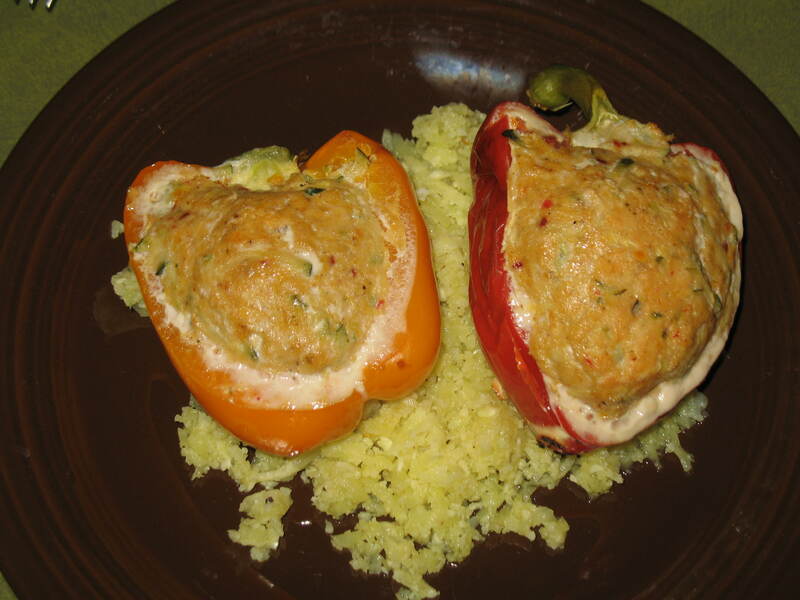 Stuffed peppers, we are go for launch! I will cover the rest of the meat in plastic wrap and refrigerate it over night. Stay tuned for part two where we stuff them and bake them. 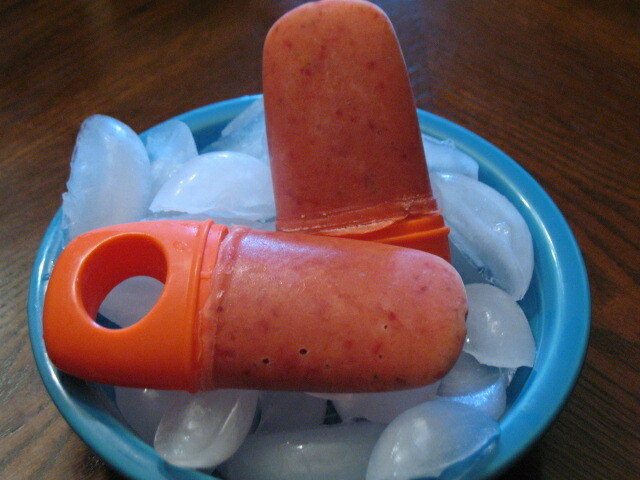 I love to eat frozen treats in the summer time. 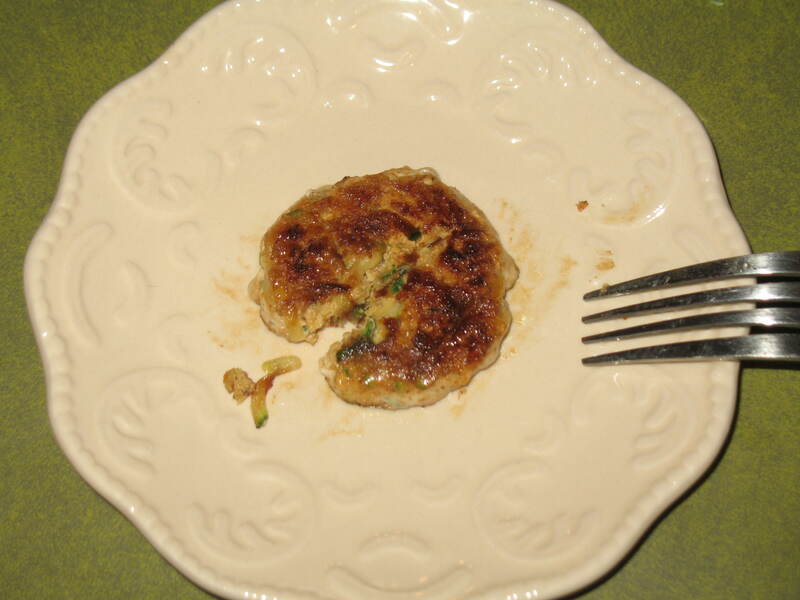 This is a paleo version of a tasty treat. If you let the fruit get extra ripe there is no need to add a sweetener to this. 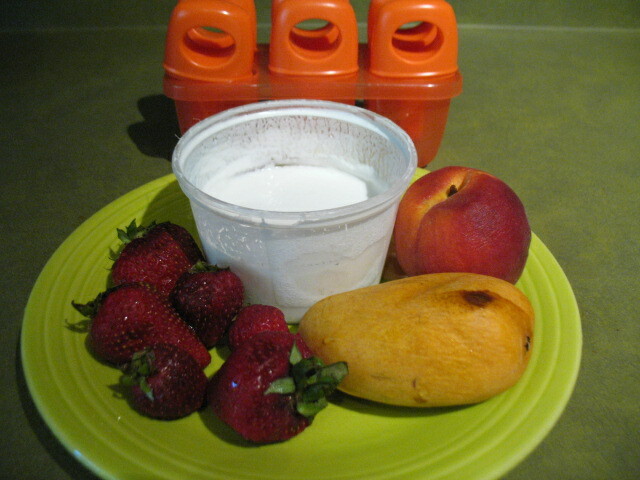 I have played around with different fruits but I really like this combination right now. 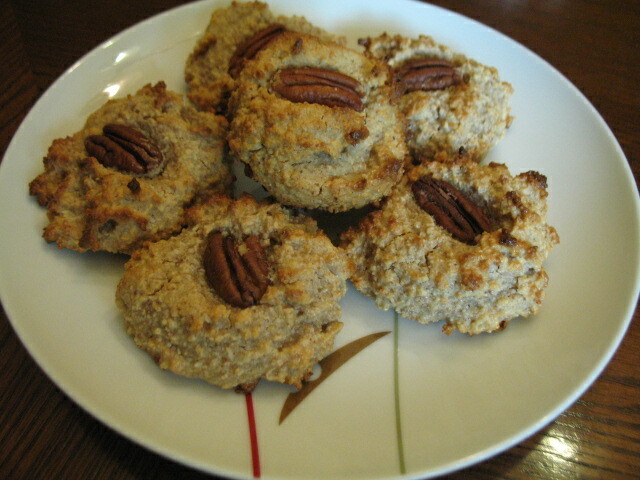 These are a super tasty treat for summer time and I don’t feel guilty eating them because it is totally paleo friendly. 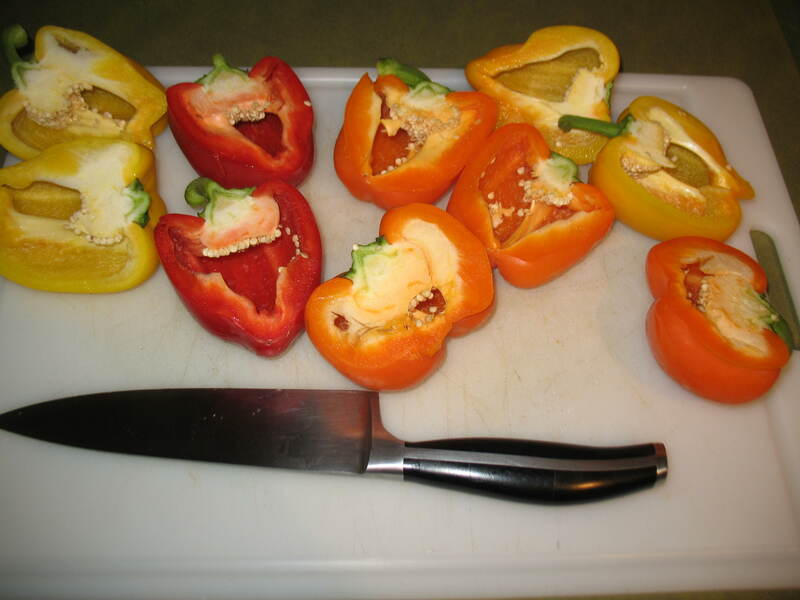 Remove stems and pits from the fruit. 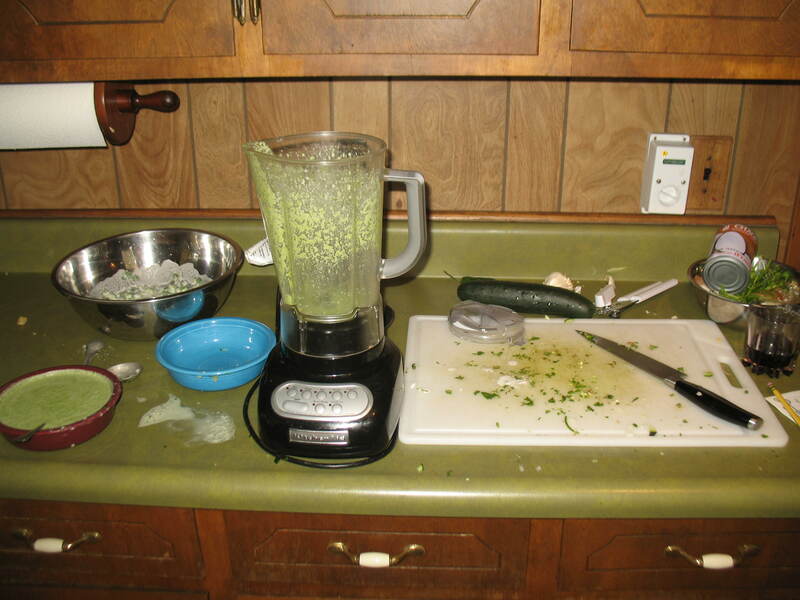 Place all items in a food processor or blender. Blend until smooth. Freeze in a tray like mine or use small paper cup with a wooden craft stick. I found my tray for around $3 at Walmart, but you can find them everywhere right now. This recipe fits perfectly in my little 6 pop tray. 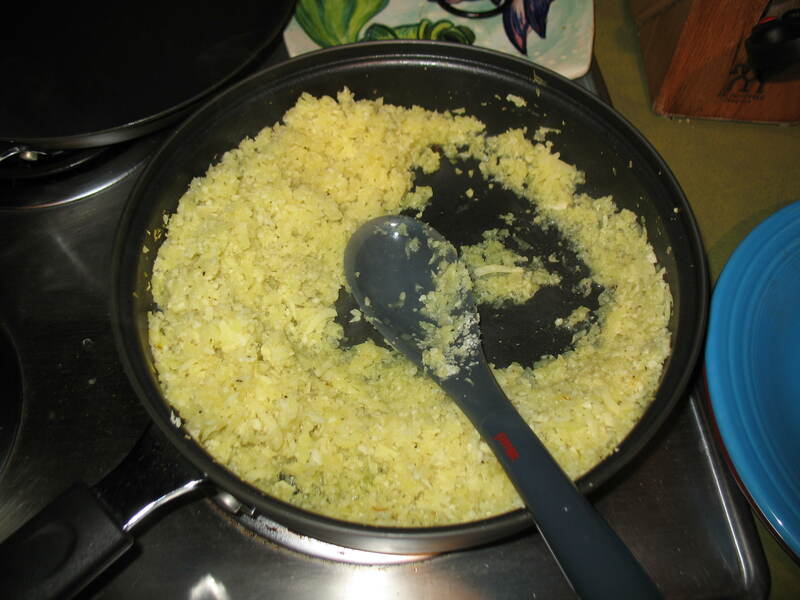 If yours is bigger, or you are making more, then of course you will need to increase the recipe. We are running low on staple foods right now so we are getting to that sad time in our fridge where inspiration and imagination take over. 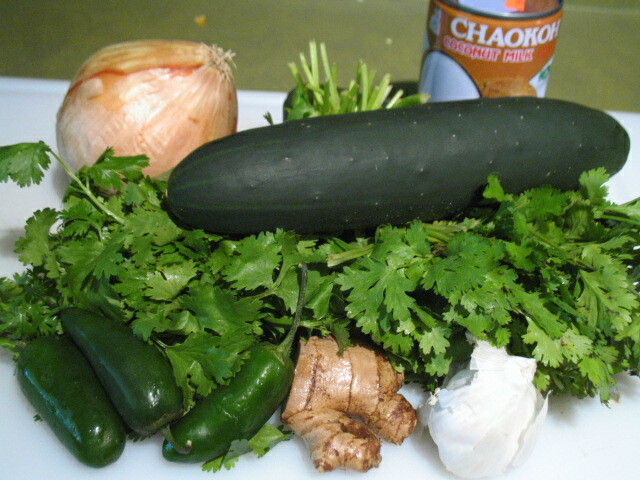 I came up with this marinade after putting together what was available. Excuse the sad looking limes, like I said it was the end of our groceries. This marinade is tangy and fresh tasting. I used it on some pork chops I cut from a pork loin. 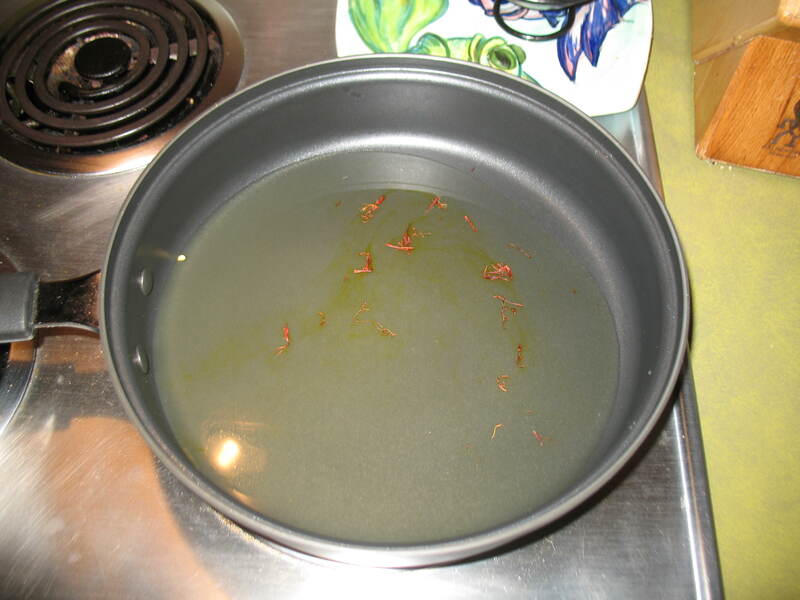 This would also taste good on chicken or shrimp. 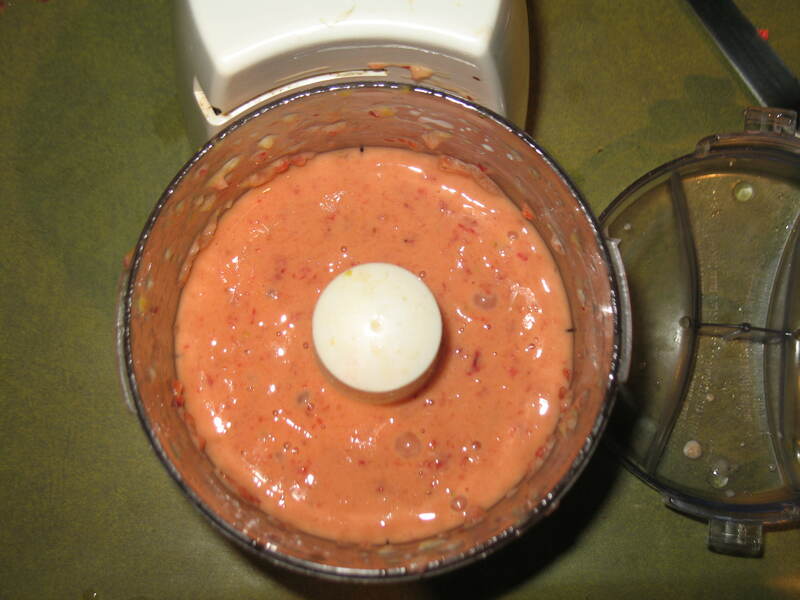 In a food processor blend all the ingredients till smooth. 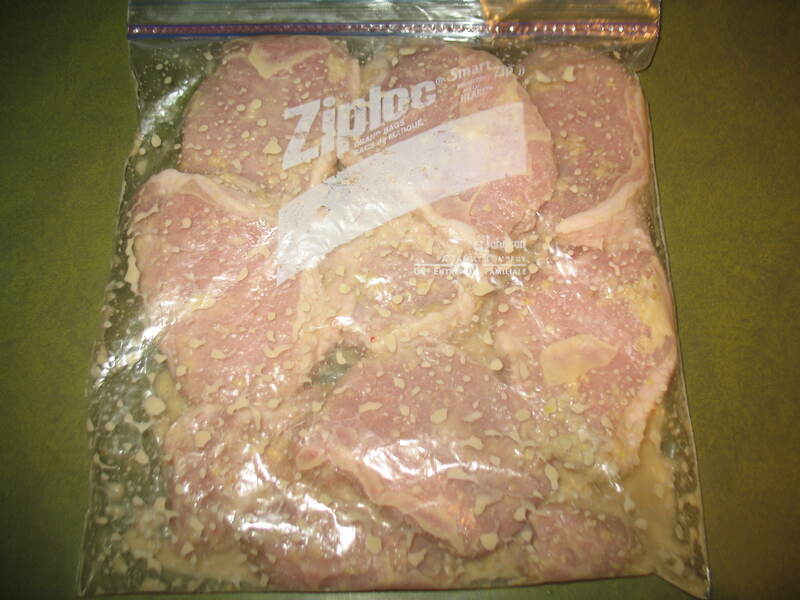 Put meat in a zip top bag and add marinade. 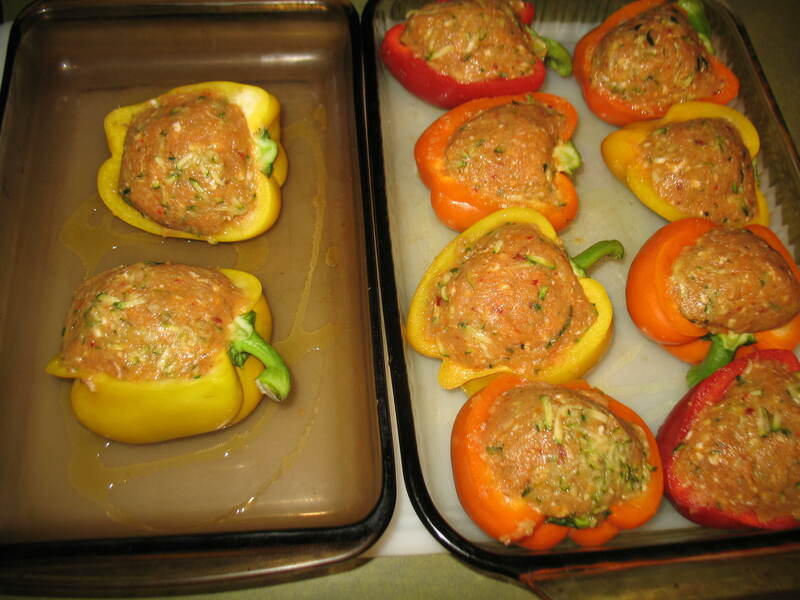 Zip tightly and marinate in your fridge for up to 3 hours. Because of the acidity of this marinade I wouldn’t let it sit over night. What happens is it starts “cooking” the meat like in ceviche and you might end up with tough meat. 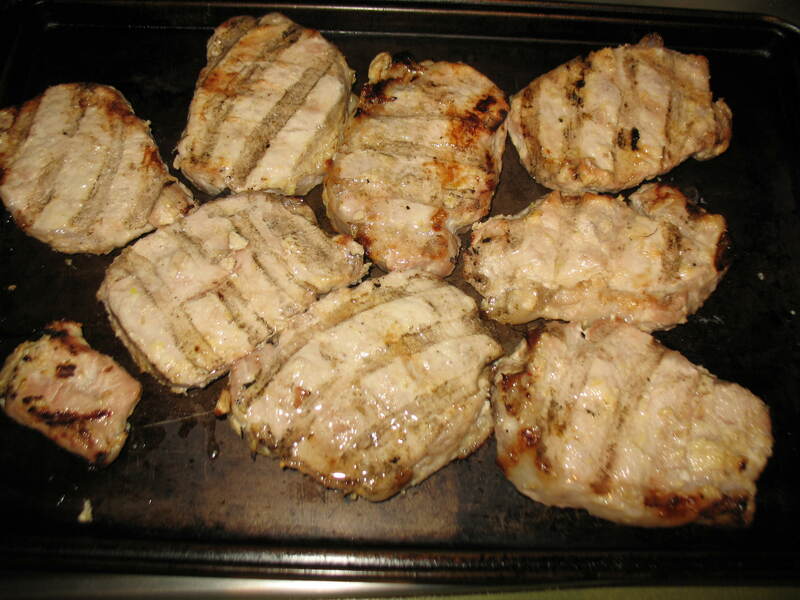 Grill meat and serve with a salad for a tangy, refreshing, summer time meal. We’ve been eating a lot of these for breakfast lately. 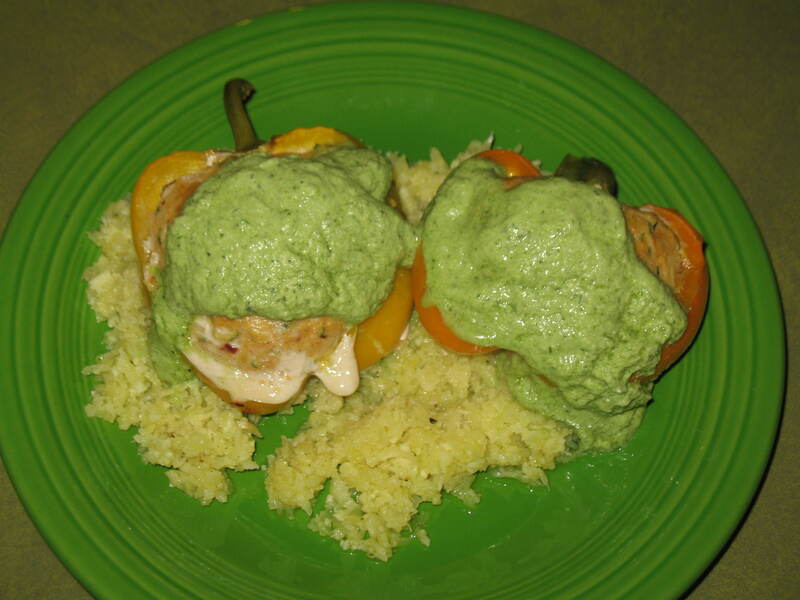 It is a great way to use up leftovers. 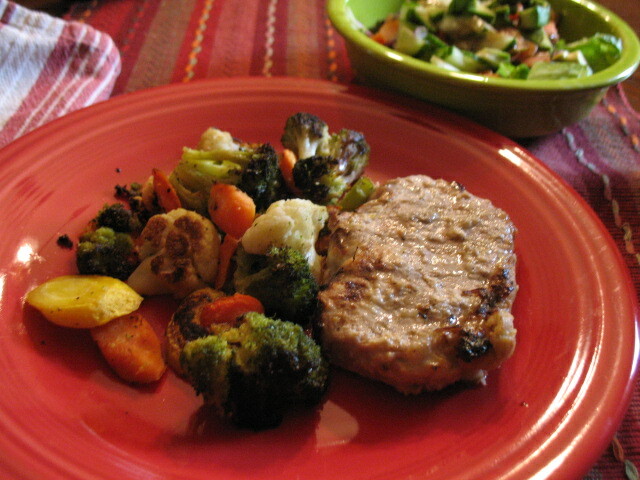 In a cast iron skillet heat up the meat and veggies. Beat about 8 eggs. Pour eggs on top of meat and veggies and place entire skillet into an oven at 400. It takes about 20 minutes to cook all the way through. When eggs have set slice like a pie and serve it up. 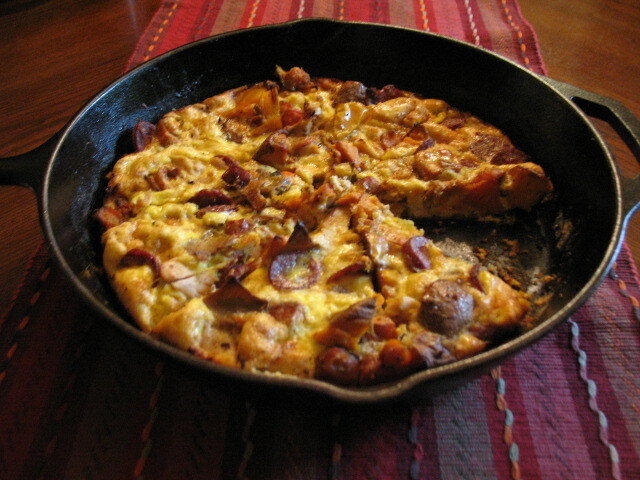 This one has leftovers from this meal with a little sliced sausage thrown in. 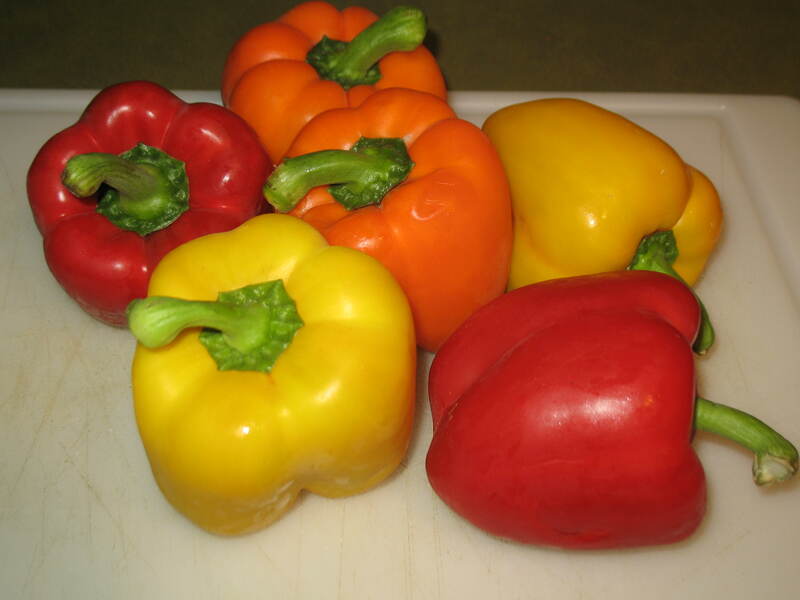 We also make one with carrots, bell peppers, chorizo, and sausage that is super tasty. Any combination of meat and veggies would be good in this. 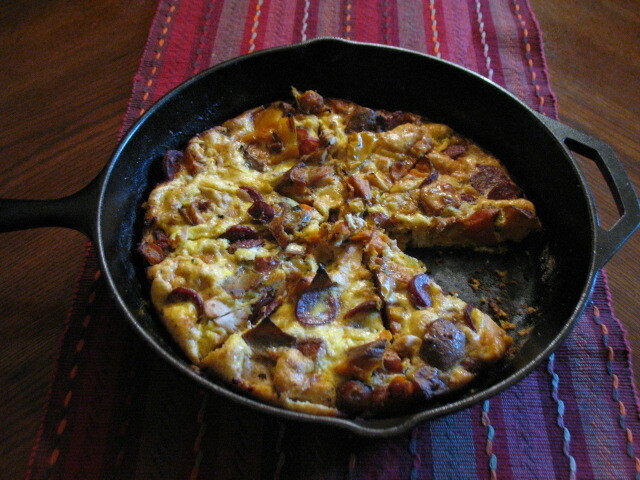 Egg pie is an easy way clean out a fridge, and makes breakfast for a whole family. Once they are cooked the slices are great for a breakfast on the go or an easy lunch.